Psychiatry is arguably the most misunderstood specialty in modern medicine and psychiatrists are often thought of as part physician, part confessor, part police officer, and part shaman. In Demystifying Psychiatry, two eminent psychiatrists offer an illuminating look at the entire field, offering a clear and informative portrait of a medical specialty often clouded in myth. 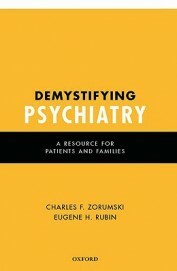 Zorumski and Rubin range from a basic discussion of what psychiatry is, to the types of illnesses psychiatrists treat, the training of psychiatrists, the treatment of psychiatric disorders (covering medications, psychotherapy, lifestyle interventions, electroconvulsive therapy, and much more), and how families can help with treatment. They caution the consumer about practices that should raise red flags. The book also covers new trends in psychiatry and explores the future of the field, predicting that major advances in genetics and neuroscience will lead to rapid and amazing changes in psychiatry. The book concludes with extensive reference materials that will be valuable both to general readers and medical practitioners.